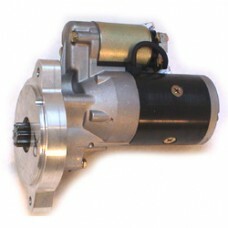 High torque gear reduction starter. 100% new with offset design that results in more clearance between the oil pan and starter. Smaller size gives greater clearance from exhausts. The high-torque, high-output motor spins the engine over faster than stock starters, delivering 40-50% more cranking power for engines up to 11:1 compression. Fits Small Block Ford 289, 302, 351W using late style manual 157 tooth flywheel. Complete with bolts.